I’ll never forgot the summer I went to camp in Golden Lake, ON back in 1989. I was 11 years old and it was my first time ever going to camp. My mom signed both my sister and I up and my aunt Lori signed my cousins, Katie and Allie up. Allie is a year older than me and we would be bunking in the same cabin. I wasn’t nervous because I knew I would know at least a few people and have someone to hang around with. In the end, I made so many new friends and we had such a blast! One of the more memorable moments about that summer that stand out to me is our hike to Blueberry Hill. The whole camp walked up this “mountain” in the wilderness that seemed like it was so far away (when it actually was pretty close!). When we finally got to the top of the mountain, we could see the whole lake. It was so pretty. I remember being so thirsty and they gave us lemonade when we got to the top. That night when I laid down in my bunk, I closed my eyes and then opened up them and it was morning. It literally felt like I just blinked. That was the only time that’s ever happened to me and I’m sure it was because of all the good fresh air and exercise I was getting from the day’s events. I believe going to summer camp is a wonderful experience for a child so that’s why I enroll my oldest daughter in camp every year since she was 9. My youngest hasn’t gone yet, but her day will come soon. Olivia looks forward to going to camp with her friends every summer and I’m sure she will look back on her days at camp with a smile just like I do. Today I want to share with you information about Pioneer Camp as well as a contest they are currently running. Pioneer Camp has locations throughout Canada and what’s unique about them is that their camps are all different and no one camp is the same as the other. In Alberta, they have two locations and their primary focus is on horsemanship. Manitoba Pioneer Camp has the most extensive daytripping and wilderness activities out of all the Pioneer Camps in Canada. Pioneer Pacific Camp on the west coast (Thetis Island) has a focus around the natural habitat- the ocean! Children can experience whale watching and water sports. Ontario Pioneer Camp has three main branches: Adventure Camp, Girl’s Camp and Boy’s Camp. Adventure Camp is all about archery, mountain biking, swimming, arts & crafts, etc. At the Girl’s & Boy’s Camp, their focus is on tripping/wildnerness, canoeing, kayaking, etc. I encourage you to check out the links and see what is available near you. The camps all sound like they would be an amazing adventure for a child. 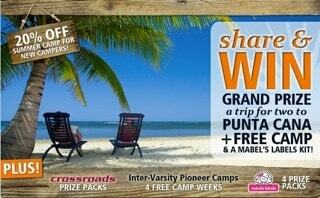 Pioneer Camp is hosting a fabulous contest right now that you won’t want to miss. The grand prize is a trip to Punta Cana, free camp for your child and a Mabel’s Labels Big Caboodle Combo Package (valued at $4700+). There’s also additional prizes for free camp sessions, Mabel’s Labels Gift Certificates and Crossroads E-Store coupons. Share with your friends for bonus entries because the more you refer people to enter the more entries you receive. The contest is open to Canada only (excludes Quebec) and ends on June 15, 2012. Check out the full rules & regulations for more details. Good luck everyone!